More accurately, this is the ad to which the buyer responded. For those who missed it, last week we posted two craigslist ads by the same seller for the same Jeep and asked which one would sell it. Both were the work of Hernando Conwi, a former marketing manager of Nissan North America, for whom global advertising powerhouse TBWA\Chiat\Day is marketing partner. “Interesting comments. I had seen the first few this morning, but the majority seem to believe that the more playful ad is the more effective. I did that ad first because I wanted to have some fun with craigslist ads, break through the clutter and convey the fun, adventurous things you can do in a Jeep CJ, even if you’re just wheeling around town running errands. I got a lot of bites on that one but no serious lookers. “Then I remembered that the grubby and playful ad was more like a brand ad — conveying brand personality and trying to generate aspirational desire. But anyone looking in craigslist already knows all about Jeeps and is looking to get the cold, hard facts about specific vehicles: engine, appointments, mileage, etc. They already know they want a CJ or a Wrangler. That’s why manufacturer ads are different from dealer ads. As ugly as dealer ads are, 100 years of learning underlie those eyesores. :-) And, I hate to admit this, but I got iWork ’09 and wanted to play with Keynote, so the slicker ad was born. The other difference is that the clean ad featured a vehicle that had just been washed and waxed. “So, in the end, it all boiled down to the target audience and where they were in the buying process. If early on, then fun and playful and personality is good. But later in the process, it’s just the facts, ma’am. Funny though, I got a few comments from people who weren’t interested but wanted to compliment me on the ads. There you have it, class. Some of you nailed it, understanding the intersection of message, audience and timing. Andrea, obviously a CSI, was the first to decipher what actually happened — that the playful ad had been posted first, because of the mileage differential. There’s an instructive story, though, in the misses. Where we didn’t get it right. The playful ad was indeed appealing. It was grubby, fun, out of the box, entertaining. Most readers, including me, intuitively liked it better. But none of us were buying a Jeep. We were just enjoying the show. Some viewers mistook an appealing ad for an effective ad — and quite confidently, too . . . Some made assumptions . . .
Others made projections; i.e., that if I like it, everyone will like it . . .
Quite a few mentioned a “target audience” but then got the wrong audience (i.e. ; non-craigslist) . . .
We have here a good illustration that graphic design is about more than graphics. No message, no matter how captivating or attractive, can overcome a fundamental misdirection. The Jeep can be running beautifully, but if it’s on the wrong road, it’s not going to get there. This is why Hernando made his midstream course correction. He kept his eye on the sale. We have a similar goal with every design we make. It may not be a sale, but it’s a result of some kind. It’s a good idea to stay with it, to be thinking, “Am I sure of this? Do I know that?” Whatever. In the end, it may simply be that this ad worked and the other one didn’t because it was the hook in the water when the fish swam by. This ad, not the other, is what the buyer saw. Which is how it is with classified ads. This has been a fun post. Thanks for every comment — without which we together wouldn’t see this stuff so clearly. We can also recommend print issue 26, specifically the article, How to design a Yellow Pages ad. Yes, we know, Yellow Pages are so 20th-century, but the principles of good design in tight spaces have not changed and are oh, so pertinent in today’s manic, online world. 21 Responses to Which ad sold the Jeep? That was instructive! Nice to see how we should stay ~always~ humble and not follow the herd but the goal. I include myself. This was a very interesting experiment! Thanks for sharing the process and allowing the feedback that helps to shed so much light on our personal prejudices and biases. So, I wonder how many inquiries came with the grubby ad and how many came with the neater ad. I don’t necessarily buy the arguments made above. I learned a lot from this Jeep exercise. I also thought the playful ad was better. A truly excellent lesson — thanks very much. Wow! This “lesson” was awesome: entertaining, informative and impactive. Great method! You recommend issue 26 for the type ad design; do you have an article on designing effectively for small space ads online? I’ve got a badge-style challenge on my to-do list which is driving me mad! I don’t think you can judge the ‘effectiveness’ of this ‘campaign’ (although it really wasn’t one) on one ad and one purchase. You’d have to test this on craigslist with multiple ads/sales and see what happens. Great exercise, really enjoyed it. I have been a craigslist car shopper a couple of times, and find that I am more drawn to ads written by people who seem to be like me. Maybe I have an implicit trust for people who have a similar approach to life. So in the case of the Jeep, it could very well have been that the combination of the ads was what worked: Shoppers, seeing the first ad, encountered a seller who is playful, doesn’t take himself too seriously, and is probably easy to deal with. The same shoppers, seeing the second ad, saw that the playful seller is also responsible, probably took good care of the Jeep, remembered to do regular oil changes, etc. That is, the shoppers encountered a seller who they could both deal with and trust; that’s attractive. Kinda wish the Jeep was still for sale, now I want it. It really is hard to say for sure which ad truly worked, since at least some of the buyers who inquired were aware that both ads were from the same seller. The clincher seems to have been the “clean” ad. But I will say this — John is right about being aware of where the buyer/target is in the purchase process. I sold a 2007 Buell motorcycle for my asking price the very same week by creating two clean ads that were halfway between the two Jeep ads. Because Buells are not well known and an acquired taste, I had to rely on intercept keywords and do a little brand building with any viewers who got lured into reading the ad. The ads had pretty good shots of my bike and looked like a manufacturer ad (but had enough specifics for a serious buyer). So much so that I had a number of lookers ask me to send photos of the actual bike! The buyer drove from two hours away and didn’t even want to hear it start up — just paid me and took off. As Jeremy said, I believe the buyer knew the seller was a little older, “educated” and probably took care of the bike like the little old lady from Pasadena. Maybe there was other text elsewhere, but the more playful ad doesn’t include the odometer reading. Only an idiot would buy a vehicle (particularly one subjected to hard, off-road use) without knowing the mileage. I don’t think it’s a fair comparison if the info is not the same in both ads. But, certainly, if specs are what the buyer wants, extracting them should be as simple as possible. No one likes to search around for the important info, and fun turns quickly into impediment. Great idea for an experiment though, thank you! @Tycho: you make a valid point about the effort involved in searching for specs in playful ads. That’s entertaining but not selling. As this blog suggests, I suspect craigslist buyers are looking for cold, hard facts. Asking price, year, mileage . . . sold. It’s great, I learn a lot; learning who’s your target audience is one key here. That’s the one I picked. Great fun. Let’s do some more. I have had a chair and a half on craigslist the regular, old way for a month or more. You know . . . a write up with three or four small pictures of the item. I kept getting nibbles, but no one actually ever bothered to come and see the chair. Then I redesigned the ad, and I immediately got two very serious inquiries. Any other success stories anyone want to share? But both ads are overkill for craigslist. All you really need is a list of the attributes — even a pic is optional. If you come across as being too slick, people are going to be wary. What puzzles me is that this is not the picture format for a craigslist ad. Craigslist pictures, for non-commercial sellers like this one, are much smaller, and the text would not have been legible. All the text is actually black on white in the body of the ad (especially if you want to attract more buyers in searches). I think a lot of people thought that there was a catch and went for the second ad, especially with your title, “the non-design design,” despite their best opinion. I don’t think that either one of the ads was overkill, not in this day and age! But for me, the bottom was definitely more annoying if more entertaining to read. Christina’s post about her chair (and my own experience on craigslist and even eBay) illustrate a key point. Buyers want to know what they are looking at, and sellers want to sell. As a buyer, I don’t care about sleek, pretty or clever, and yes, you aren’t required to provide a picture, but they help. But the picture isn’t helpful if it’s unclear, out of focus, too small, or artsy. As a matter of fact, I’m looking for a bike on craigslist (I already know that I desire the bike), and if I saw the top Jeep ad for the model I want, I’d contact the seller asap. That ad gives me everything I need to know in a clear (and clean) way. The first ad looks like it’s from someone meticulous and who, by extension, took good care of the car. The second ad looks like it’s from someone who isn’t into maintenance, and, by extension, that’s probably why the car is for sale. That’s the impression the ads give before reading a single word. As a prospective buyer, I wouldn’t have bothered to read #2, because I’d assume another $2,000 or so in repairs would be coming up quickly. In this economy, and in my opinion, that’s going to override Jeep’s casual brand positioning. I’m a little late in the game here, but when I first saw the 2nd ad I thought it looked like the work of owner’s child. I was expecting some reversed lettering and felt the sun in the corner lacked a smiley face. The first ad is “conservative” only when it comes to the information. The graph paper background, yellow Post-it, and angled Polariod photo make the rest of the photo conservatively playful. Being an ex-Jeep owner, I liked the cleaner ad because it looks like the Jeep would give me fewer problems (it wasn’t trying to distract me). 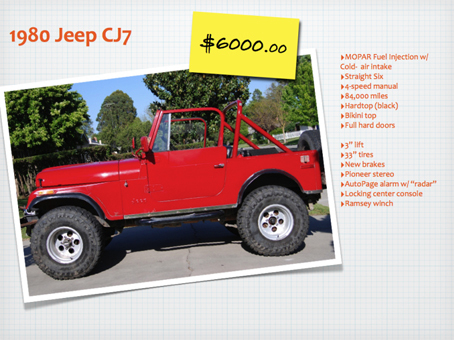 Jeep owners are fun, but there needs to be an air of seriousness also (it is $6,000 for a 1980 vehicle). When buying an older Jeep, it has to run before you can have fun (no rust please!). Also, I don’t know if anyone touched on this, but the “funny” ad states 3rd owner, and the clean ad didn’t. Looking at the two ads both as a designer and a Jeep owner, I prefer the first (clean) ad much more than the second ad. Granted this is late in the game (i.e., long after it is won), but there is something fundamentally distracting about the yellow, handwritten lettering. It does speak to the, uh, “Jeeper” in me on a hey-that’s-neat level, but the designer in me repels from it for this medium — it might be entertaining for a TV ad campaign . . . hmmm. Anyway, I think the Polaroid-esque photo speaks well to the target market also: i.e., we have taken many pictures of our Jeep — from when we first got it, through all the transitions, and whenever we get the chance to take it off-road (yay mud puddles!). I’ve had a good few cars in my life and have never had the urge to take multiple pictures of any of them. Many of the 4by and Jeep sites are littered with pictures of people’s vehicles — share the fun! This is a point people have been making: Jeeps are generally fun cars, and anyone thinking of buying one on craigslist already knows it. The second ad shows that the seller is proud of his vehicle, lists important info succinctly, and is just a generally nicely designed ad.